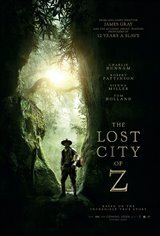 The incredible true story of British explorer Col. Percival Fawcett (Charlie Hunnam), who journeys into the Amazon in 1906 and discovers evidence of a previously unknown, advanced civilization. Despite ridicule from the scientific establishment who perceive indigenous peoples as savages, Fawcett is driven at any cost to learn about the ways in which those of the Amazon eke out a living. He is supported by his wife (Sienna Miller), and throughout his numerous treks, encouraged by his son (Tom Holland) and aide-de-camp Henry Costin (Robert Pattinson). Based on author David Grann's nonfiction bestseller of the same name.